One of, if not my favorite, genres of Heavy Metal (there are a multitude by the way for the uninitiated) is the NWOBHM. So many amazing bands, a few that made it big (IRON MAIDEN, DEF LEPPARD, SAXON) but most plied their trade in relative obscurity in the pubs & clubs of the U.K. before calling it a day. One such band was Cleveland’s (and yes, some of our beloved American big cities were named after their U.K. counterparts including Boston for example) MILLENNIUM. To confuse matters a bit, on their initial vinyl debut, the outstanding Pure Overkill compilation from 1983 alongside the amazing SPARTAN WARRIOR among others, the band spelling was MILLENIUM on the cover, but not the vinyl itself. By the time 1984 had rolled around, the label Guardian Records had fixed said flub for their self-titled debut. A solid album it was too, chock full of pure headbanging fury and fist-raising anthems. But alas, like all but for the few aforementioned bands, MILLENNIUM called it a day after a few demos in the mid-eighties. Singer Mark Duffy went on to sing for TORANAGA, who enjoyed some success in the latter stages of the Eighties. 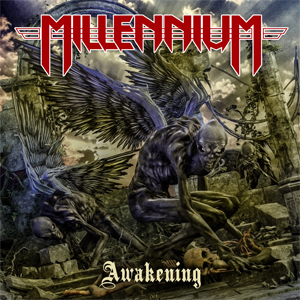 Fast forward to 2016 and as the worldwide resurgence of the NWOBHM has continued to blossom and the long suffering bands are finally able to enjoy the recognition & accolades they so rightly deserve, Mark Duffy resurrects MILLENNIUM from its dusty tomb. The album Caught In A Warzone was released, and gives the band the momentum it needs to storm ahead with their latest Awakening, which dropped at the tail end of 2017 (October 25 to be precise). Usually in these situations, it’s one captain steering the ship from the venerable early lineup, but still along for the ride with Mr. Duffy is drummer Steve Mennell, whose been pounding the skins since their inception. Guitarist Dave Hardy has been with MILLENNIUM since 1985, alternating with some bass playing as well. The band is rounded out by Andy Fisher (bass) and Will Philpot (guitars), both members since 2015. Awakening kicks off with "False Reality" and immediately the razor sharp riffs hit you squarely between the eyes from a tight, crisp production. A strong chorus and some twin leads add to this fine opening salvo. "Rise Above" is pure headbanging fury and is guaranteed to go over like a storm live! A personal fave here. "Searching" downshifts the MILLENNIUM engine a touch with some tender acoustics before ratcheting it back up to a fist-banging anthem. A nice touch there. "The Spell" is a short intro that leads into the galloping chug of the title track. A tasty solo adds to its heaviness. "Lies All Lies" is a riffing monster that’s as heavy as lead. A killer solo with whammy bar just adds to the power of the track. "The Calling" is a slower dirge but don’t let the tempo fool you as none of the power has been lost. "Witch Hunt" is an uptempo banger about one of the darker periods of history with the needless slaughter of innocent women falsely accused of witchcraft. The crushing heaviness of the track does the dark tale justice. "When Mad Men Rule" slows things back down a smidge musically but the title of the track let’s you know that lyrically it’s still full steam ahead as Mark waxed poetically about the madness of people in positions of power. "Revolution Calls" takes the tempo back up with a headbanging rallying cry for us all to wake up before it’s too late. “Come on make some Noise”!!! Album closer "Possessed" ends the album on a high note with a double-bass neck breaker that will leave chiropractors everywhere with a waiting room full of patients. Kudos to the band as anything on this album will fit seamlessly in a set with the classic earlier material. An album that MILLENNIUM should be well proud of as they aren’t just resting on the laurels of past glories but forging ahead with quality, top notch songwriting. I don’t know the possibilities of seeing the band live on these shores, but you can surely throw your support behind the lads by seeking out and purchasing Awakening in digital or CD format. Long live the NWOBHM!!! For my Vinyl familia, no Vinyl as of yet. Keep those fingers crossed though that one of the fine smaller labels might pick this up for release.